September 17, 1862, was America's bloodiest day. When it ended, 3,654 soldiers lay dead on the land surrounding Antietam Creek in Western Maryland. The battle fought there was as deadly as the stakes were high. For the first time, the Rebels had taken the war into Union territory. A Southern victory would have ended the war and split the nation in two. Instead, the North managed to drive the Confederate army back into Virginia. Emboldened by victory, albeit by the thinnest of margins, Lincoln issued the Emancipation Proclamation, freeing the slaves and investing the war with a new, higher purpose. In this vivid, character-rich narrative, acclaimed author Justin Martin reveals why this battle was the Civil War's tipping point. The battle featured an unusually rich cast of characters and witnessed important advances in medicine and communications. But the impact of the battle on politics and society was its most important legacy. Had the outcome been different, Martin argues, critical might-have-beens would have rippled forward to the present, creating a different society and two nations. 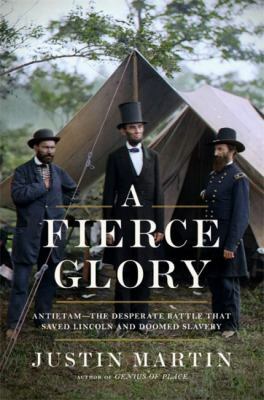 A Fierce Glory is an engaging account of the Civil War's most important battle.